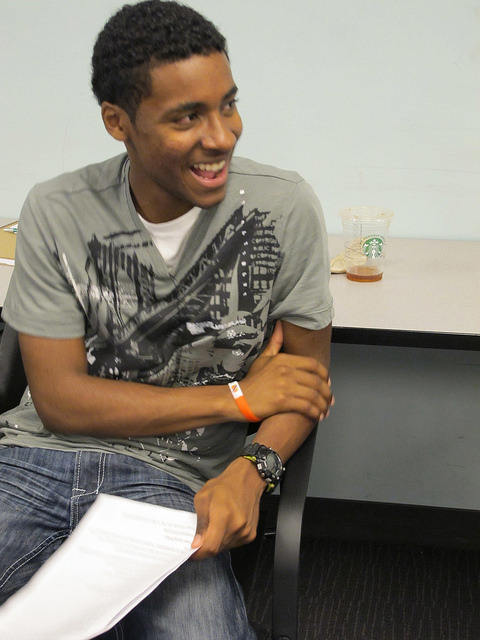 This year the NYCWP made great strides to expand its offerings to young writers in our Youth Voices programming. This development has become possible through grants totaling $50,000 from the Hive Digital Media Learning Fund of the New York Community Trust and the National Writing Project. The 2014 Youth Voices Inquiry Project will directly engage 30 students and 10 teachers from schools throughout New York City, with a particular focus in the Bronx, in using reading, writing and digital media to explore their interests and passions. YVIP provides both an intensive summer program at Lehman College and a school-year academic extension for participating teachers and students. The program will recruit from the network of teachers and schools that are currently active in the New York City Writing Project. Lehman College will provide laptops and other technology for participants to use each day. In the Youth Voices Inquiry Project, students and teachers will work as co-learners connecting personal passions with academic learning and civic engagement. They will create digital essays, stories, and poems; analyze and produce videos and podcasts; and design coding projects. Among other things, the project will serve as a laboratory to explore the relationships between interest-based and disciplinary learning. Program outcomes will include open curriculum projects, YVIP-focused episodes of BronxNet’s Open 2.0, and new understandings about learner-created digital badges. For more information, visit www.youthvoices.net. Our Youth Voices Summer Inquiry Project ran from July 8 – 24, 2014. Students and teachers learned alongside each other over 12 wonderful sessions. Students were encouraged to use technology to help them learn more about their interests and passions, to write, and to read the work of other students. They also designed digital badges to award to one another, learned how to use HTML scratch, and made lasting friendships with other students throughout New York City.